For other uses, see Gentry (disambiguation). Cleric, Knight, and Peasant archetypes represent the virtues of prudence, fortitude, and temperance, respectively. In Classical antiquity and Christendom, prudence and fortitude were seen as the cardinal virtues that should govern society. Gentry (from Old French genterie, from gentil, "high-born, noble") are "well-born, genteel and well-bred people" of high social class, especially in the past. In the United Kingdom, the term gentry refers to the landed gentry, the majority of the land-owning social class who were typically armigerous (having a coat of arms), but did not have titles of nobility. 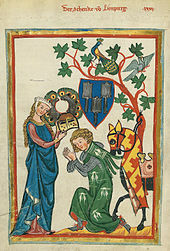 Gentry, in its widest connotation, refers to people of good social position connected to landed estates (see manorialism), upper levels of the clergy, and "gentle" families of long descent who never obtained the official right to bear a coat of arms. The historical term gentry by itself, so Peter Coss argues, is a construct that historians have applied loosely to rather different societies. Any particular model may not fit a specific society, yet a single definition nevertheless remains desirable. Linguistically, the word gentry arose to identify the social stratum created by the very small number, by the standards of Continental Europe, of the Peerage of England, and of the parts of Britain, where nobility and titles are inherited by a single person, rather than the family, as usual in Europe. 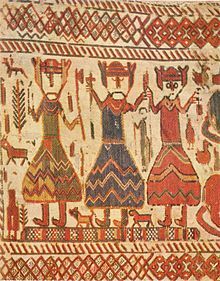 This part of a 12th-century Swedish tapestry has been interpreted to show, from left to right, the one-eyed Odin, the hammer-wielding Thor and Freyr. This triad corresponds closely to the trifunctional division: Odin is the patron of priests and magicians, Thor of warriors, and Freyr of fertility and farming. The Indo-Europeans who settled Europe, Central and Western Asia and the Indian subcontinent conceived their societies to be ordered (not divided) in a tripartite fashion, the three parts being castes. Castes came to be further divided, perhaps as a result of greater specialisation. The "classic" formulation of the caste system as largely described by Georges Dumézil was that of a priestly or religiously occupied caste, a warrior caste, and a worker caste. Dumézil divided the Proto-Indo-Europeans into three categories: sovereignty, military, and productivity (see Trifunctional hypothesis). He further subdivided sovereignty into two distinct and complementary sub-parts. One part was formal, juridical, and priestly, but rooted in this world. The other was powerful, unpredictable, and also priestly, but rooted in the "other", the supernatural and spiritual world. The second main division was connected with the use of force, the military, and war. Finally, there was a third group, ruled by the other two, whose role was productivity: herding, farming, and crafts. This system of caste roles can be seen in the castes which flourished on the Indian subcontinent and amongst the Italic peoples. Kings were born out of the warrior or noble class. Emperor Constantine convoked the First Council of Nicaea in 325 whose Nicene Creed included belief in "one holy catholic and apostolic Church". Emperor Theodosius I made Nicene Christianity the state church of the Roman Empire with the Edict of Thessalonica of 380. After the fall of the Western Roman Empire in the 5th century, there emerged no single powerful secular government in the West, but there was a central ecclesiastical power in Rome, the Catholic Church. In this power vacuum, the Church rose to become the dominant power in the West. In essence, the earliest vision of Christendom was a vision of a Christian theocracy, a government founded upon and upholding Christian values, whose institutions are spread through and over with Christian doctrine. The Catholic Church's peak of authority over all European Christians and their common endeavours of the Christian community—for example, the Crusades, the fight against the Moors in the Iberian Peninsula and against the Ottomans in the Balkans—helped to develop a sense of communal identity against the obstacle of Europe's deep political divisions. Beyond the fact that Clerical celibacy functioned as a spiritual discipline it also was guarantor of the independence of the Church. the Catholic Church has always aspired to a preponderant share in political power, it has never been able to monopolize it entirely, because of two traits, chiefly, that are basic in its structure. Celibacy has generally been required of the clergy and of monks. Therefore no real dynasties of abbots and bishops have ever been able to establish themselves. ... Secondly, in spite of numerous examples to the contrary supplied by the warlike Middle Ages, the ecclesiastical calling has by its very nature never been strictly compatible with the bearing of arms. The precept that exhorts the Church to abhor bloodshed has never dropped completely out of sight, and in relatively tranquil and orderly times it has always been very much to the fore. The fundamental social structure in Europe in the Middle Ages was between the ecclesiastical hierarchy, nobles i.e. the tenants in chivalry (counts, barons, knights, esquires, franklins) and the ignobles, the villeins, citizens, and burgesses. The division of society into classes of nobles and ignobles, in the smaller regions of medieval Europe was inexact. After the Protestant Reformation, social intermingling between the noble class and the hereditary clerical upper class became a feature in the monarchies of Nordic countries. The gentility is primarily formed on the bases of the medieval societies' two higher estates of the realm, nobility and clergy, both exempted from taxation. Subsequent "gentle" families of long descent who never obtained official rights to bear a coat of arms were also admitted to the rural upper-class society: the gentry. First estate included the group of all clergy, that is, members of the higher clergy and the lower clergy. Second estate has been encapsulated by the nobility. Here too, it did not matter whether they came from a lower or higher nobility or if they were impoverished members. Third estate included all nominally free citizens; in some places, free peasants. At the top of the pyramid were the princes and estates of the king or emperor, or with the clergy, the bishops and the pope. The feudal system was, for the people of the Middle Ages and early modern period, fitted into a God-given order. The nobility and the third estate were born into their class, and change in social position was slow. Wealth had little influence on what estate one belonged to. The exception was the Medieval Church, which was the only institution where competent men (and women) of merit could reach, in one lifetime, the highest positions in society. The first estate comprised the entire clergy, traditionally divided into "higher" and "lower" clergy. Although there was no formal demarcation between the two categories, the upper clergy were, effectively, clerical nobility, from the families of the second estate or as in the case of Cardinal Wolsey, from more humble backgrounds. The second estate was the nobility. Being wealthy or influential did not automatically make one a noble, and not all nobles were wealthy and influential (aristocratic families have lost their fortunes in various ways, and the concept of the "poor nobleman" is almost as old as nobility itself). Countries without a feudal tradition did not have a nobility as such. The nobility of a person might be either inherited or earned. Nobility in its most general and strict sense is an acknowledged preeminence that is hereditary: legitimate descendants (or all male descendants, in some societies) of nobles are nobles, unless explicitly stripped of the privilege. The terms aristocrat and aristocracy are a less formal means to refer to persons belonging to this social milieu. Historically in some cultures, members of an upper class often did not have to work for a living, as they were supported by earned or inherited investments (often real estate), although members of the upper class may have had less actual money than merchants. Upper-class status commonly derived from the social position of one's family and not from one's own achievements or wealth. Much of the population that comprised the upper class consisted of aristocrats, ruling families, titled people, and religious hierarchs. These people were usually born into their status, and historically, there was not much movement across class boundaries. This is to say that it was much harder for an individual to move up in class simply because of the structure of society. In many countries, the term upper class was intimately associated with hereditary land ownership and titles. Political power was often in the hands of the landowners in many pre-industrial societies (which was one of the causes of the French Revolution), despite there being no legal barriers to land ownership for other social classes. Power began to shift from upper-class landed families to the general population in the early modern age, leading to marital alliances between the two groups, providing the foundation for the modern upper classes in the West. Upper-class landowners in Europe were often also members of the titled nobility, though not necessarily: the prevalence of titles of nobility varied widely from country to country. Some upper classes were almost entirely untitled, for example, the Szlachta of the Polish-Lithuanian Commonwealth. Before the Age of Absolutism, institutions, such as the church, legislatures, or social elites, restrained monarchical power. Absolutism was characterized by the ending of feudal partitioning, consolidation of power with the monarch, rise of state, rise of professional standing armies, professional bureaucracies, the codification of state laws, and the rise of ideologies that justify the absolutist monarchy. Hence, Absolutism was made possible by new innovations and characterized as a phenomenon of Early Modern Europe, rather than that of the Middle Ages, where the clergy and nobility counterbalanced as a result of mutual rivalry. From the middle of the 1860s the privileged position of Baltic Germans in the Russian Empire began to waver. Already during the reign of Nicholas I (1825–55), who was under pressure from Russian nationalists, some sporadic steps had been taken towards the russification of the provinces. Later, the Baltic Germans faced fierce attacks from the Russian nationalist press, which accused the Baltic aristocracy of separatism, and advocated closer linguistic and administrative integration with Russia. Social division was based on the dominance of the Baltic Germans which formed the upper classes while the majority of indigenous population, called "Undeutsch", composed the peasantry. In the Imperial census of 1897, 98,573 Germans (7.58% of total population) lived in the Governorate of Livonia, 51,017 (7.57%) in the Governorate of Curonia, and 16,037 (3.89%) in the Governorate of Estonia. The social changes faced by the emancipation, both social and national, of the Estonians and Latvians where not taken seriously by the Baltic German gentry. The provisional government of Russia after 1917 revolution gave the Estonians and Latvians self-governance which meant the end of the Baltic German era in Baltics. The Lithuanian gentry consisted mainly of Lithuanians, but due to strong ties to Poland, had been culturally Polonized. After the Union of Lublin in 1569, they became less distinguishable from Polish szlachta, although preserved Lithuanian national awareness. In the history of the Polish–Lithuanian Commonwealth, "gentry" is often used in English to describe the Polish landed gentry (Polish: ziemiaństwo, ziemianie, from ziemia, "land"). They were the lesser members of the nobility (the szlachta), contrasting with the much smaller but more powerful group of "magnate" families (sing. magnat, plural magnaci in Polish), the Magnates of Poland and Lithuania. Compared to the situation in England and some other parts of Europe, these two parts of the overall "nobility" to a large extent operated as different classes, and were often in conflict. After the Partitions of Poland, at least in the stereotypes of 19th-century nationalist lore, the magnates often made themselves at home in the capitals and courts of the partitioning powers, while the gentry remained on their estates, keeping the national culture alive. From the 15th century, only the szlachta, and a few patrician bughers from some cities, were allowed to own rural estates of any size, as part of the very extensive szlachta privileges. These restrictions were reduced or removed after the Partitions of Poland, and commoner landowners began to emerge. By the 19th century, there were at least 60,000 szlachta families, most rather poor, and many no longer owning land. By then the "gentry" included many non-noble landowners. In Spanish nobility and former Portuguese nobility, see hidalgos and infanzones. In Sweden, there was not outright serfdom. Hence, the gentry was a class of well-off citizens that had grown from the wealthier or more powerful members of the peasantry. The two historically legally privileged classes in Sweden were the Swedish nobility (Adeln), a rather small group numerically, and the clergy, which were part of the so-called frälse (a classification defined by tax exemptions and representation in the diet). At the head of the Swedish clergy stood the Archbishop of Uppsala since 1164. The clergy encompassed almost all the educated men of the day and furthermore was strengthened by considerable wealth, and thus it came naturally to play a significant political role. Until the Reformation, the clergy was the first estate but was relegated to the secular estate in the Protestant North Europe. In the Middle Ages, celibacy in the Catholic Church had been a natural barrier to the formation of an hereditary priestly class. After compulsory celibacy was abolished in Sweden during the Reformation, the formation of a hereditary priestly class became possible, whereby wealth and clerical positions were frequently inheritable. Hence the bishops and the vicars, who formed the clerical upper class, would frequently have manors similar to those of other country gentry. Hence continued the medieval Church legacy of the intermingling between noble class and clerical upper class and the intermarriage as the distinctive element in several Nordic countries after the Reformation. Surnames in Sweden can be traced to the 15th century, when they were first used by the Gentry (Frälse), i.e., priests and nobles. The names of these were usually in Swedish, Latin, German or Greek. The adoption of Latin names was first used by the Catholic clergy in the 15th century. The given name was preceded by Herr (Sir), such as Herr Lars, Herr Olof, Herr Hans, followed by a Latinized form of patronymic names, e.g., Lars Petersson Latinized as Laurentius Petri. Starting from the time of the Reformation, the Latinized form of their birthplace (Laurentius Petri Gothus, from Östergötland) became a common naming practice for the clergy. In the 17th and 18th centuries, the surname was only rarely the original family name of the ennobled; usually, a more imposing new name was chosen. This was a period which produced a myriad of two-word Swedish-language family names for the nobility (very favored prefixes were Adler, "eagle"; Ehren – "ära", "honor"; Silfver, "silver"; and Gyllen, "golden"). The regular difference with Britain was that it became the new surname of the whole house, and the old surname was dropped altogether. The Western Ukrainian Clergy of the Ukrainian Greek Catholic Church were a hereditary tight-knit social caste that dominated western Ukrainian society from the late eighteenth until the mid-20th centuries, following the reforms instituted by Joseph II, Emperor of Austria. Because, like their Orthodox brethren, Ukrainian Catholic priests could marry, they were able to establish "priestly dynasties", often associated with specific regions, for many generations. Numbering approximately 2,000–2,500 by the 19th century, priestly families tended to marry within their group, constituting a tight-knit hereditary caste. In the absence of a significant native nobility and enjoying a virtual monopoly on education and wealth within western Ukrainian society, the clergy came to form that group's native aristocracy. The clergy adopted Austria's role for them as bringers of culture and education to the Ukrainian countryside. Most Ukrainian social and political movements in Austrian-controlled territory emerged or were highly influenced by the clergy themselves or by their children. This influence was so great that western Ukrainians were accused of wanting to create a theocracy in western Ukraine by their Polish rivals. The central role played by the Ukrainian clergy or their children in western Ukrainian society would weaken somewhat at the end of the 19th century but would continue until the mid-20th century. The British upper classes consist of two sometimes overlapping entities, the peerage and landed gentry; any male member of either may regard himself as a gentleman, in a special sense mutually understood between hereditary members of the class, which will often exclude life peers. In the British peerage, only the senior family member (typically the eldest son) inherits a substantive title (duke, marquess, earl, viscount, baron); these are referred to as peers or lords. The rest of the nobility are referred to as "landed gentry" (abbreviated "gentry"). Except for the eldest sons of peers, who bear their fathers' inferior titles as "courtesy titles" (but for Parliamentary purposes count as commoners), they usually bear no titles apart from the qualifications of esquire or gentleman (which are ranks recognised in law, although now without any legal consequence); exceptions include the baronet (a title corresponding to a hereditary knighthood), those that are knighted (for life, called Sir X Y), Scottish barons (who bear the designation Baron of X after their name), and Scottish lairds (whose names include a description of their lands in the form of a territorial designation). The term landed gentry, although originally used to mean nobility, came to be used for the lesser nobility in England around 1540. Once identical, these terms eventually became complementary. The term gentry by itself, as commonly used by historians, according to Peter Coss, is a construct applied loosely to rather different societies. Any particular model may not fit a specific society, yet a single definition nevertheless remains desirable. Titles, while often considered central to the upper class, are not strictly so. Both Captain Mark Phillips and Vice Admiral Sir Timothy Laurence, the respective first and second husbands of HRH Princess Anne, lacked any rank of peerage at the time of their marriage to Princess Anne. However, the backgrounds of both men were considered to be essentially patrician, and they were thus deemed[by whom?] suitable husbands for a princess. The landed gentry is a traditional British social class consisting of gentlemen in the original sense; that is, those who owned land in the form of country estates to such an extent that they were not required to actively work, except in an administrative capacity on their own lands. The estates were often (but not always) made up of tenanted farms, in which case the gentleman could live entirely off rent income. Esquire (abbreviated Esq.) is a term derived from the French "écuyer" (which also gave equerry) the lowest designation for a nobleman, referring only to males, and used to denote a high but indeterminate social status. The most common occurrence of term Esquire today is the conferral as the suffix Esq. in order to pay an informal compliment to a male recipient by way of implying gentle birth. In the post-medieval world, the title of esquire came to apply to all men of the higher landed gentry; an esquire ranked socially above a gentleman but below a knight. In the modern world, where all men are assumed to be gentlemen, the term has often been extended (albeit only in very formal writing) to all men without any higher title. It is used post-nominally, usually in abbreviated form (for example, "Thomas Smith, Esq."). 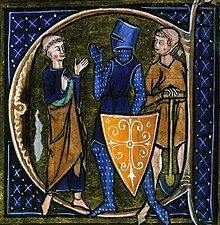 A knight can be either a medieval tenant giving military service as a mounted man-at-arms to a feudal landholder, or a medieval gentleman-soldier, usually high-born, raised by a sovereign to privileged military status after training as a page and squire (for a contemporary reference, see British honours system). In formal protocol, Sir is the correct styling for a knight or for a baronet, used with (one of) the knight's given name(s) or full name, but not with the surname alone. The equivalent for a woman who holds the title in her own right is Dame; for such women, the title Dame is used as Sir for a man, never before the surname on its own. This usage was devised[by whom?] in 1917, derived from the practice, up to the 17th century (and still also in legal proceedings), for the wife of a knight. The wife of a knight or baronet is now styled "Lady [Surname]". The Colonial American use of gentry followed the British usage (i.e., landed gentry); before the independence of the United States, Southern planters were often the younger sons of British landowners, who perpetuated the British system in rural Virginia and Charleston, South Carolina, by employing tenant farmers, indentured servants, and chattel slaves. In the Northeastern United States, the gentry included (colonial and British) offshoot families who established the city of Boston, Massachusetts, and Harvard and Yale colleges. The families of Virginia (see First Families of Virginia) formed the Virginia gentry class as the old guard of plantation owners in United States. As General Robert E. Lee's paternal ancestors were among the earliest settlers in Virginia, his family was considered among the oldest of the Virginia gentry class. The concept of the gentleman farmer as a man who farms mainly for pleasure rather than for profit was not only a model for the Southern gentry, but very much an ideal befitting some of founding fathers of America, such as Thomas Jefferson and George Washington. Washington resumed the life of a gentleman farmer at his Mount Vernon estate in Virginia following his resignation as commander in chief of the army in December 1783. The American gentry, even in cases where the family never had obtained official rights to bear a coat of arms in history, bore all the same hallmarks of traditional elite as in the old continent. First Families of Virginia originated with colonists from England who primarily settled at Jamestown and along the James River and other navigable waters in the Colony of Virginia during the 17th century. As there was a propensity to marry within their narrow social scope for many generations, many descendants bear surnames which became common in the growing colony. Many of the original English colonists considered members of the First Families of Virginia migrated to the Colony of Virginia during the English Civil War and English Interregnum period (1642–60). Royalists left England on the accession to power of Oliver Cromwell and his Parliament. Because most of Virginia's leading families recognised Charles II as King following the execution of Charles I in 1649, Charles II is reputed to have called Virginia his "Old Dominion", a nickname that endures today. Most of such early settlers in Virginia were so-called "Second Sons". Primogeniture favored the first sons' inheriting lands and titles in England. Virginia evolved in a society of second or third sons of English aristocracy who inherited land grants or land in Virginia. They formed part of the southern elite in America. 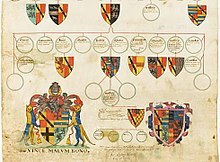 Many of the great Virginia dynasties traced their roots to families like the Lees and the Fitzhughs, who traced lineage to England's county families and baronial legacies. But not all: even the most humble Virginia immigrants aspired to the English manorial trappings of their betters. The Colonial families of Maryland were the leading families in the Province of Maryland. Several also had interests in the Colony of Virginia, and the two are sometimes referred to as the Chesapeake Colonies. Many of the early settlers came from the West Midlands in England, although the Maryland families were composed of a variety of European nationalities, e.g., French, Irish, Welsh, Scottish, and Swedish, in addition to English. Charles I of England granted the province palatinate status under Cecilius Calvert, 2nd Baron Baltimore. The foundational charter created an aristocracy of lords of the manor for Maryland. Maryland was uniquely created as a colony for Catholic aristocracy and landed gentry, but Anglicanism eventually came to dominate, as Protestant immigrants led a rebellion against the Calvert government. The 'four divisions of society' refers to the model of society in ancient China and was a meritocratic social class system in China and other subsequently influenced Confucian societies. The four castes—gentry, farmers, artisans and merchants—are combined to form the term Shìnónggōngshāng (士農工商). Gentry (士) means different things in different countries. In China, Korea, and Vietnam, this meant that the Confucian scholar gentry that would – for the most part – make up most of the bureaucracy. This caste would comprise both the more-or-less hereditary aristocracy as well as the meritocratic scholars that rise through the rank by public service and, later, by imperial exams. Some sources, such as Xunzi, list farmers before the gentry, based on the Confucian view that they directly contributed to the welfare of the state. In China, the farmer lifestyle is also closely linked with the ideals of Confucian gentlemen. In Japan, this caste essentially equates to the samurai class. In the Edo period, with the creation of the Domains (han) under the rule of Tokugawa Ieyasu, all land was confiscated and reissued as fiefdoms to the daimyōs. The small lords, the samurai (武士, bushi), were ordered either to give up their swords and rights and remain on their lands as peasants or to move to the castle cities to become paid retainers of the daimyōs. Only a few samurai were allowed to remain in the countryside; the landed samurai (郷士, gōshi). Some 5 per cent of the population were samurai. Only the samurai could have proper surnames, something that after the Meiji Restoration became compulsory to all inhabitants (see Japanese name). There were two leading classes, i.e. the gentry, in the time of feudal Japan: the daimyō and the samurai. The Confucian ideals in the Japanese culture emphasised the importance of productive members of society, so farmers and fishermen were considered of a higher status than merchants. Emperor Meiji abolished the samurai's right to be the only armed force in favor of a more modern, Western-style, conscripted army in 1873. Samurai became Shizoku (士族), but the right to wear a katana in public was eventually abolished along with the right to execute commoners who paid them disrespect. In defining how a modern Japan should be, members of the Meiji government decided to follow in the footsteps of the United Kingdom and Germany, basing the country on the concept of noblesse oblige. Samurai were not to be a political force under the new order. The difference between the Japanese and European feudal systems was that European feudalism was grounded in Roman legal structure, while Japan feudalism had Chinese Confucian morality as its basis. Korean monarchy and the native ruling upper class existed in Korea until the end of the Japanese occupation. The system concerning the nobility is roughly the same as that of the Chinese nobility. As the Jesuits and other preceding monastical orders did during Europe's Dark Ages, the Buddhist monks became the purveyors and guardians of Korea's literary traditions while documenting Korea's written history and legacies from the Silla period to the end of the Goryeo dynasty. Korean Buddhist monks also developed and used the first movable metal type printing presses in history—some 500 years before Gutenberg—to print ancient Buddhist texts. Buddhist monks also engaged in record keeping, food storage and distribution, as well as the ability to exercise power by influencing the Goryeo royal court. Historically, the nobles in Europe became soldiers; the aristocracy in Europe can trace their origins to military leaders from the migration period and the Middle Ages. For many years, the British Army, together with the Church, was seen as the ideal career for the younger sons of the aristocracy. Although now much diminished, the practice has not totally disappeared. Such practices are not unique to the British either geographically or historically. As a very practical form of displaying patriotism, it has been at times "fashionable" for "gentlemen" to participate in the military. The fundamental idea of gentry had come to be that of the essential superiority of the fighting man, usually maintained in the granting of arms. At the last, the wearing of a sword on all occasions was the outward and visible sign of a "gentleman"; the custom survives in the sword worn with "court dress". A suggestion that a gentleman must have a coat of arms was vigorously advanced by certain 19th- and 20th-century heraldists, notably Arthur Charles Fox-Davies in England and Thomas Innes of Learney in Scotland. The significance of a right to a coat of arms was that it was definitive proof of the status of gentleman, but it recognised rather than conferred such a status, and the status could be and frequently was accepted without a right to a coat of arms. Chivalry[b] is a term related to the medieval institution of knighthood. It is usually associated with ideals of knightly virtues, honour and courtly love. Christianity had a modifying influence on the virtues of chivalry, with limits placed on knights to protect and honour the weaker members of society and maintain peace. The church became more tolerant of war in the defence of faith, espousing theories of the just war. In the 11th century, the concept of a "knight of Christ" (miles Christi) gained currency in France, Spain and Italy. These concepts of "religious chivalry" were further elaborated in the era of the Crusades. In the later Middle Ages, wealthy merchants strove to adopt chivalric attitudes. This was a democratisation of chivalry, leading to a new genre called the courtesy book, which were guides to the behaviour of "gentlemen". These three areas obviously overlap quite frequently in chivalry and are often indistinguishable. Another classification of chivalry divides it into warrior, religious and courtly love strands. One particular similarity between all three of these categories is honour. Honour is the foundational and guiding principle of chivalry. Thus, for the knight, honour would be one of the guides of action. The term gentleman (from Latin gentilis, belonging to a race or gens, and "man", cognate with the French word gentilhomme, the Spanish hombre gentil and the Italian gentil uomo or gentiluomo), in its original and strict signification, denoted a man of good family, analogous to the Latin generosus (its invariable translation in English-Latin documents). In this sense the word equates with the French gentilhomme ("nobleman"), which was in Great Britain long confined to the peerage. The term gentry (from the Old French genterise for gentelise) has much of the social-class significance of the French noblesse or of the German Adel, but without the strict technical requirements of those traditions (such as quarters of nobility). To a degree, gentleman signified a man with an income derived from landed property, a legacy or some other source and was thus independently wealthy and did not need to work. The opposite of the Jūnzǐ was the Xiǎorén (小人), literally "small person" or "petty person". Like English "small", the word in this context in Chinese can mean petty in mind and heart, narrowly self-interested, greedy, superficial, and materialistic. The idea of noblesse oblige, "nobility obliges", among gentry is, as the Oxford English Dictionary expresses, that the term "suggests noble ancestry constrains to honorable behaviour; privilege entails to responsibility". Being a noble meant that one had responsibilities to lead, manage and so on. One was not to simply spend one's time in idle pursuits. A coat of arms is a heraldic device dating to the 12th century in Europe. It was originally a cloth tunic worn over or in place of armour to establish identity in battle. The coat of arms is drawn with heraldic rules for a person, family or organisation. Family coats of arms were originally derived from personal ones, which then became extended in time to the whole family. In Scotland, family coats of arms are still personal ones and are mainly used by the head of the family. Ecclesiastical heraldry is the tradition of heraldry developed by Christian clergy. Initially used to mark documents, ecclesiastical heraldry evolved as a system for identifying people and dioceses. It is most formalised within the Catholic Church, where most bishops, including the pope, have a personal coat of arms. Clergy in Anglican, Lutheran, Eastern Catholic, and Orthodox churches follow similar customs. ^ Following the admired example of the Roman patrician, the Venetian patrician reverted, especially in the Renaissance, to a life more focused on his rural estate. ^ Etymology: English from 1292, loans from French chevalerie "knighthood", from chevalier "knight" from Medieval Latin caballarius "horseman"; cavalry is from the Middle French form of the same word. ^ "Gentry", Advanced Learner's Dictionary, Cambridge . ^ "Gentry", English Dictionary, Oxford . ^ Leiren, Terje I. (1999). "From Pagan to Christian: The Story in the 12th-Century Tapestry of the Skog Church". Facutly.washington.edu. ^ Boyd, William Kenneth (1905). The Ecclesiastical Edicts of the Theodosian Code, Columbia University Press. ^ a b Durant, Will (2005). Story of Philosophy. Simon & Schuster. ISBN 978-0-671-69500-2. Retrieved 10 December 2013. ^ "Celibacy as Political Resistance". First Things. January 2014. Retrieved 7 January 2014. ^ Mosca, Gaetano (1939). The Ruling Class. McGraw Hill Book Company, Inc. Retrieved 3 January 2014. ^ "French Absolutism". SUNY Suffolk history department. Retrieved 2007-09-29. ^ Language Statistics of 1897 (in Russian), RU: Demoscope, archived from the original on 2011-06-29 . ^ Ross, M. (1835). "A DESCRIPTIVE VIEW OF POLAND: CHARACTER, MANNERS, AND CUSTOMS OF THE POLES". A HISTORY OF POLAND FROM ITS FOUNDATION AS A STATE TO THE PRESENT TIME; INCLUDING A FULL ACCOUNT OF THE RECENT PATRIOTIC STRUGGLE TO RE-ESTABLISH ITS INDEPENDENCE. TO WHICH IS PREFIXED, A DESCRIPTIVE VIEW OF THE COUNTRY, ITS NATURAL HISTORY, CITIES AND TOWNS, AND THE MANNERS AND CUSTOMS OF ITS INHABITANTS. 48 Pilgrim Street, Newcastle upon Tyne, Northumberland county, North East region, ENGLAND: PATTISON AND ROSS. p. 51. At least 60,000 families belong to this class [nobility], of which, however, only about 100 are wealthy ; all the rest are poor. ^ Subtelny, Orest (1988), Ukraine: A History, Toronto: University of Toronto Press, pp. 214–19 . ^ Himka, John Paul (1999), Religion and Nationality in Western Ukraine, Montreal and Kingston: McGill-Queen's University Press, p. 10 . ^ "The Court of the Lord Lyon". Retrieved 2010-06-22. ^ Hicks, Michael, The Origins of the English Gentry (review) (402), UK . ^ Coss, Peter, The Origins of the English Gentry (PDF), Cambridge University Press, ISBN 0-52102100-6 . ^ Snyder, MR (October 1994), Japanese vs. European Feudalism (guest lecturer), CA: Alberta Vocational College . ^ Selden, John (1614). Titles of Honour. p. 707. ^ a b c d Sweeney, James Ross (1983), "Chivalry", The Dictionary of the Middle Ages, III . ^ "Coat of arms", Encyclopædia Britannica (online ed.) .